After designing and working with a Form Wizard it is natural to think about designing a Report Wizard too. Because of the designing task of a Form and Report is almost same, except Page Footer with Page Number and date. If you have gone through the designing task of the Form Wizard then you don't have to do it again. Please go through the earlier Post: Custom made Form Wizard to understand the designing task of the FormWizard or to download it from there. Make a copy of the FormWizard and rename it as ReportWizard. Open the ReportWizard in Design View. Change the List Box and Combo Box headings to read as Report Format and Select Table/Query for Report respectively. Change the word Form to Report in the left side labels. Display the Code Module of the ReportWizard by selecting View - ->Code (or Alt+F11). Press Ctrl+A to select the entire Code in the Form Module and press Delete Key to delete the Code. MsgBox "Select a File from Table/Query List. ", vbOKOnly + vbExclamation, "cmdNext"
MsgBox Err & ": " & Err.Description, , "cmdNext_Click"
strSQL1 = "SELECT MSysObjects.Name " & "
FROM MSysObjects  " & "
WHERE (((MSysObjects.Type)=1 Or (MSysObjects.Type)=5) " & "AND ((Left([Name],4))'WizQ') AND ((Left([Name],1))'~') " & "AND ((MSysObjects.Flags)=0)) " & "
ORDER BY MSysObjects.Type, MSysObjects.Name; "
MsgBox Err & ": " & Err.Description, , "Form_Open"
MsgBox "Fields Not Selected for Report! " .NAME = FldList(j) & " Label"
.ControlSource = "='Page : ' & [page] & ' / ' & [pages] "
.ControlSource = "='Date : ' & Format(Date(),'dd/mm/yyyy') "
strRSource = SelctList.RowSource: strRS2 = ""
strRSource = FldList.RowSource: strRS2 = ""
Open the ReportWizard in Normal View. 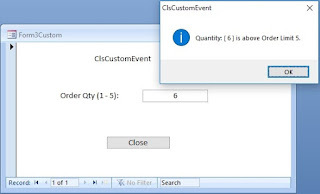 Select a Table or Query from the Combo Box. Select Tabular Wizard option from above. Click OK to load the selected Table/Query Field List and open the List of Fields. Select the Fields for the Report from the List Box. Click Finish to create the Report. Normally, after creating the Report we need to modify the Detail Section Controls to make their sizes according to the data type and field sizes. After these changes the Report Footer created by the Wizard may not match with the modification that we have made. But, we already have a solution for this in an earlier Post with the Title: Draw Page Border. One of the following two Programs presented there can be used for drawing a new Page Footer (after deleting the existing Page Footer) or to resize it after changes made to the Detail Section Controls. There are other Reports related Functions also presented there to make Report Designing tasks easier. You may take a look at them as well. After creating the 3D-Text you can customize it by changing the Fonts, Fore-Color and Styles like Bold, Italics or Underline.